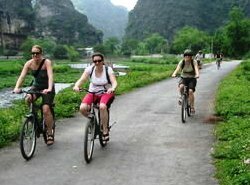 The 3-day adventure Trekking And Cycling in Ba Be National Park in the north eastern Vietnam. The drive from Hanoi to Ba Be Park takes about 6 hours. You have nearly three days for your active adventure travel holidays, including such activities jungle trek , visit ethnic villages, boat cruise and biking around national park. Spending two nights at local home (homestay) in a Tay village also offers interesting experience. Ba Be Lake is situated in Bac Kan province which is 240 km northeast of Ha Noi Capital. Today, on the way from Ha Noi, we will pay a visit to the Thai Nguyen Minority and Culture Museum where we can learn something about the culture and traditions of the different minority groups in Vietnam. 8.30am After breakfast your tour guide will take you on a trek to Pac Ngoi village where the local people live by fishing and growing rice and corn on the land of “Soi Bai”. We will walk along the stream edge to view the stilt houses. We will borrow bikes from a local family and cycle to the Tày ethnic – 4 area where we explore an amazing cave in the mountain. The journey continues to Silk waterfall which is about another five km by bike. If it’s hot, copy the local kids and jump in and swim. We will have a picnic lunch at the waterfall. In the afternoon we come back and leave the bikes and walk around Ba Be lake shore and try to capture some great photo shots of the sunset. We’ll go to the local markets for souvenirs and then back to our Homestay by boat. Dinner and overnight at Bo Lu village. After breakfast at the Homestay, check out and leave the bags on the car. Don’t forget your camera though because today is a chance for some more great shots. Travelling on our private boat we go through the entire length of the 3 connected lakes (Ba Be – “3 bays”) and up the Nang River, to an astonishing site, Dong Puong, an enormous cave (300m long by 30m high) that the river has tunnelled right through a limestone mountain. The boat then goes up river to the small village of Tay people. Time to say goodbye to Mr Boatman, and we transfer to the car for our return journey, stopping for lunch on the way. You should be ped off at your hotel at about 5 pm. We take you to places normal tour don’t go! – 3 – 5 km hike on Day 1. – 24 – 30 km trek and bike on Day 2. – 2 -4 km hike on Day 3.